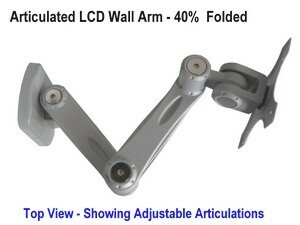 This is a solid cantilever folding LCD monitor arm. 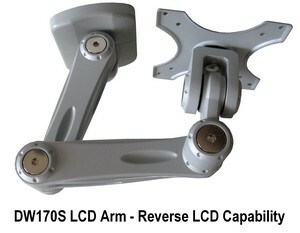 Its has the capability of extending out the monitor to the desired position, and then pushing it back towards the wall, almost flush, when the extended reach is not necessary. 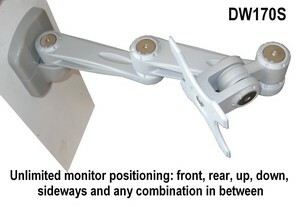 Its viewing possibilities are quite unlimited, as the monitor can face almost anywhere: more than 90 degrees to any side as well as 100% to the floor or ceiling. It can also be aimed around a corner. 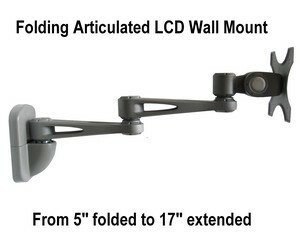 The monitor can also be viewed in landscape or potrait mode thanks to the 360 degree rotation of the VESA mounting plate. 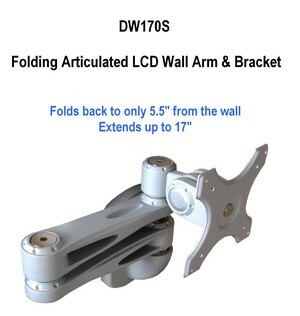 Ideal for special projects. * Torque adjustment: the torque (smoothness) of the articulations can be easily adjusted by using the provided torque wrench. 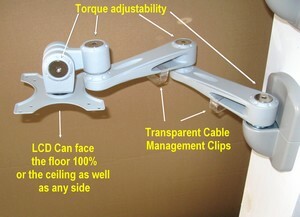 The three swivel and articulation adjustment bolts are shown in the image above (swivel motions), while the tilt articulation adjustment bolt can be seen below.